It was a story that broke on this blog nearly two years ago when the American Board of Internal Medicine (ABIM) Foundation was putting their luxury condominium, complete with a chauffeur-driven Mercedes S-Class town car that was purchased with physician certification and re-certification fees, up for sale. Over 550 days later, we find the notorious ABIM Foundation condominium was finally sold on 6/21/2016 for $1,650,000 representing an up-front cash loss of $650,000. Other fees: deed preparation, attorney fees, recording fees, etc. $10,000. 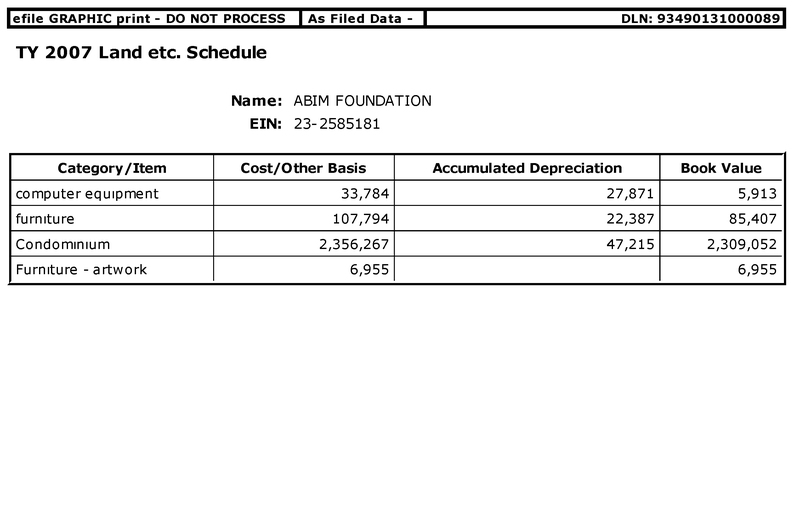 All told, ABIM took $2,356,267 million of ABIM diplomat's cash and lost at least $1,265,267 on our behalf. So much for "Choosing Wisely®." But let's face it, incurring a financial loss on an "investment" is not necessarily illegal. After all, any of us could have made a horrible investment decision. Rest assured we'll soon hear the ABIM trying to justify their real estate loss because they would have lost this money anyway if they had to pay hotel costs for all of their out-of-town guests and programmers from India eager for a cheap place to stay. But we should ask ourselves now with the sale of this condominium, what was illegal at the ABIM Foundation? Anything? First, recall that Dr. Baron claimed in my communications with him that much of the condominium expenses they claimed on their tax forms as program service expenses was actually a depreciation expense they lumped into the "program services expenses" of the condominium. Yet the ABIM and their accountants never claimed depreciation under the separate line item on their federal IRS Form 990 for this expense. Unlikely. After all, other tax filing discrepancies with the ABIM Foundation have occurred repeatedly and systematically over many years. Any credible accounting audit should have disclosed most of them. For instance, surely someone at the ABIM knew the difference between the two states of Iowa and Pennsylvania, didn't they? So why was the ABIM Foundation domicile claimed as Iowa for years when, in fact, it was domiciled in Pennsylvania but never disclosed? And isn't it striking that the ABIM Foundation was claimed for years as being formed in 1999 until this blog disclosed that it was actually created in 1989, some ten years earlier? Only in its most recent tax filings has that little "oversight" miraculously been corrected without explanation to the Internal Revenue Service. And why didn't the ABIM disclose that it was lobbying Congress on its tax forms when it had been doing so for years? Was this merely a mistake? Or was it because the ABIM and their Foundation would have opened themselves up to closer scrutiny and lost their tax-exempt status if they had? Finally, we have to ask ourselves just what kind of research on physicians for the betterment of health care requires a $2.3 million condominium? After all, the ABIM Foundation has always heavily touted their research work and publications. Some may argue there wasn't "research" being conducted at the ABIM Foundation but rather "quality assurance" or "Quality Improvement" exercises performed there. If so, then why did the ABIM Foundation promote it's pioneering research by using the term at least five times on a single web page in May of 2007? There is no escaping the fact that this was a very serious effort at conducting "research" on physicians. Was the whole "research" story told by the ABIM and ABIM Foundation just a front for other activities? I wish to bring my reader's attention that the ABIM Foundation no longer has the word "research" appear anywhere on its website. Instead, there are only words like "Medical Professionalism Charter," "Initiatives," "Grants" and "Choosing Wisely®." The cover-up continues. Credentialing of physicians involves human testing. As such, it appears the ABIM Foundation unilaterally decided to perform research on physicians without informed consent, without an impartial Investigational Review Board, and without a clear research hypothesis, method, or analysis of the harms they might cause. "Research" conducted in such a manner is dangerous for many reasons and some of the most egregious examples of dangerous research have happened in government agencies or when the individual or collective social beliefs or dogma were imposed on others as justification for "research." This means that the person involved should have the legal capacity to give consent; should be so situated as to be able to exercise free power of choice, without the intervention of any element of force, fraud, deceit, duress, over-reaching, or other ulterior form of constraint or coercion; and should have sufficient knowledge and comprehension of the elements the subject matter involved, as to enable him to make an understanding and enlightened decision. This latter element requires that, before the acceptance of an affirmative decision by the experimental subject, there should be made known to him the nature, duration, and purpose of the experiment; the method and means it is to be conducted; all inconveniences and hazards reasonably to be expected; and the effects upon his health or person, which may possibly come from his participation in the experiment. The duty and responsibility for ascertaining the quality of the consent rests upon each individual who initiates, directs, or engages in the experiment. It is a personal duty and responsibility which may not be delegated to another with impunity." It goes without saying that human subject research that involves real estate investment strategies to fund research on practicing physicians is unethical (at least) and likely highly illegal. As we have seen, the MOC recertification program can cause significant harm to physicians, their patients, and their families, especially when this credential is tied to physician employment and remuneration. Worse still, the average failure rate of the unproven "Maintenance of Certification" re-certification metric has averaged 13.2% over the past 10 years with wide year-to-year volatility in pass rates using an inconsistent metric. Was the impact of funneling money from the ABIM to the ABIM Foundation for the ABIM Foundation's "research" really that harmful? But this story isn't about a condominium or its sale, is it? It's about the wholesale sell-out by some in Organized Medicine that have systematically and repeatedly turned their back on their fellow practicing physicians and the doctor-patient relationship for their own political and financial benefit. For this story is not just restricted to the ABIM or its Foundation. This story extends to all member organizations of the Accreditation Council for Graduate Medical Education (ACGME) that tie the ABMS Board certification credential to medical training program directors, lab certifications, and a host of other regulatory traps, too. So it should come as a surprise to no one that we find more recently that each of these organizations appears to have been complicit with the ABIM Foundation moving funds derived from practicing physicians' "research" fees offshore. In the end, the entire American Board of Medical Specialties' Maintenance of Certification® story has alway been about making money for their coffers at the expense of practicing physicians, irrespective of the specialty. It's NEVER been about "Choosing Wisely®." This is Richard Baron's Wikipedia page. I haven't had the heart to change it from the self serving blurb it is now to what it should be: about a man who steered a $50,000,000 corporation, created by cyphoning money from the pockets of poor residents, into further into denial and unaccountability. It would be great if this page was edited to include the rants and exchanges he engaged in with Newsweek. It would be great that along with all his accolades, the page was edited to reflect that he was the first sitting ceo to receive an official vote of no confidence from a prestogious medical society. I believe in Choosing Wisely....NBPAS. Richard Baron... time to leave. Were/are subsidizations of bogus Gallup polls with deceiving/misleading questions and answers an example of what the ABIM Foundation did with the money? Little more than creative scientific propaganda to lie to physicians, the public in order to bolster false reasons for creating and maintaining the MOC revenue? Note Wachter's link to the 2003 Gallup poll mentioned in his lengthy sales pitch about his 8 years at the ABIM is no longer current or has been deleted by the ABIM. See below. Also John A Benson Jr. president of the ABIM from 1975-1991 makes an interesting comment with a follow up by Wachter. Why did not Benson sign his name to the American Board of Internal Medicine Foundation registration/creation in 1989. Only CFO Strozeski! There are a great many question left unanswered including the Hedge Fund activities the ABIM engaged in back during Benson and Kimball's "regimes." Why did not ABIM's president Kimball sign the 1999 Pennsylvania registration. Only Christine Cassel as ABIM Foundation Chair? Wachter's blog site reflections state that Richard Baron is "a great listener with impeccable values and an unerring ethical compass. He’ll be splendid." Why has he received a vote of no confidence then? BTW Wiley takes your information and uses it extensively when you use "Wachter's" site. Bogus Gallup polls. "Dr" Blizzard DBA worked for United Health for 11 years to give an example of how potentially biased the Gallup polls and interpretive commentary on them can be. When crooks hide, obstruct, obfuscate, confuse, distract, withhold, shred, secretly transfer $$$, stonewall, omit and delete; present false evidence, abuse power, tamper with evidence, bully, intimidate, harass, violate, spy, clandestinely record, lie on CV's, cheat and the like (the list goes on and on) we usually see the DOJ asking questions and investigating or storming in to seize property in order to indict. There really is one set of laws for ordinary folks and one set of laws for the elite. The frightening bit is how much power the elites have to harm others. Should Dr. Baron resign? Should his crony Dr. Cassel resign as an advisor to the president of the United States? Should Clinton resign her candidacy for the most powerful position in the world? Trust is important. Integrity is important. They have, each in their own way, squandered whatever trust anyone ever had in them and whatever integrity they once had. If they had honesty and integrity they would step down and resign. All the evidence points toward ABIM executives misusing their offices and tax-exempt status by working primarily on the politically-charged healthcare reform of Christine Cassel, Robert Wachter, Richard Baron, and the social democrat movement, which they still represent today. Since Dr. Cassel and her executive staff hid the lobbying and buried the condo finances on the 990 filings this looks suspicious. It is clear that this data was systematically kept from the IRS. We can conclude that the ABIM was used as a political action committee and private personal financier based on the actual whereabouts and activities of Christine Cassel and others from 2007-present. Nobody is fooled by obfuscated tax forms when they see Christine Cassel in Washington DC working to convince the president of the United States that socialized healthcare is what our country (Kaiser Permanente, and Premier, Inc.) needs. ABIM executives and their cronies used the condo for lobbying and "business entertaining" associated with their campaign for healthcare reform. I say this because most of Christine Cassel's activities and travels were associated with her decades-long zealous push for partisan healthcare reform. When Cassel traveled occasionally to Philadelphia, she and her husband needed a place to stay. Also, ABIM people officers like Bob Wachter, a high ranking medical politician who set the deal to purchase the condo in motion, benefited from nesting at the condo as well. Hillary Clinton admitted recently that before "Obama Care" it was called "Hillary Care." Christine Cassel was one of the architects of Hillary Care as an advisor to the Clinton administration. 1. The ABIM board established a foundation to serve as a big piggy bank. 2. The ABIM accrued surpluses over the course of its nearly 100 years of existence. 3. Between 1990 and 2008, the Board took the bulk of its reserves (about $55 million, when all the contributions are added up) and placed them in a Foundation, whose charge was to support the Board’s work and serve the broader medical community. 6. ABIM was a client of 1838 Investment Advisors. 7. ABIM Foundation transferred its investment accounts to 1838 Investment Advisors before its previous investment broker went bankrupt. 8. ABIM was a loyal investment client of Drexel Firestone. 9. 1n 1965 ABIM registered in Pennsylvania as a foreign corporation to take advantage of its newly amended bylaws giving greater freedom to create corporate and political partnerships, increase revenues and seek new investment opportunities. 10. ABIM was a satisfied client of Drexel Harriman Ripley. 11. ABIM investment accounts reaped huge profits in the 1980's. 12. ABIM Foundation investment accounts had large gains during the 1990's. 13. ABIM Foundation lost its shirt in risky investment practices with 1838 Investment Advisors--established by former Drexel Burnham Lambert executives-- losing millions of dollars during the dot com market crash in the early 2000's. 14. ABIM executives have had a history of making risky investments unsuitable for a non-profit organization. 15. ABIM transferred its investment accounts to Drexel, Burnham, Lambert in 1976. 16. In March 1989, a federal grand jury indicted Michael Milken of Drexel Burnham Lambert on 98 counts of racketeering and fraud. The indictment accused Milken of a litany of misconduct, including insider trading, stock parking (concealing the real owner of a stock), tax evasion and numerous instances of repayment of illicit profits. 17. Milken plead guilty to several counts of his original indictment and was sentenced to 10 years in prison. 18. Richard Baron has a house in the Cayman Islands and a country estate near New Grange, Ireland. 19. Christine Cassel is member of a secret society with George Soros. 20. None of the mentioned investment firms associated with the ABIM and ABIM Foundation are viable entities today. All are defunct. ABIM, American Board of Internal Medicine Foundation, and ABIM Foundation were all clients of the now defunct 1838 Investment Advisors. When the Lights Go Out: ABIM's Investment Practices. Taking on too much risk. By Douglas Appell | August 8, 2005"
"KING OF PRUSSIA, Pa. — 1838 Investment Advisors LP, a money manager with a long history and more than $14 billion under management at its peak, closed at the end of June, industry sources said." "Plagued by weak performance, the company's assets under management had fallen to $3.6 billion by March 2004, when a management team and Orca Bay Partners, a Seattle-based private equity firm, bought out the company from its parent, MBIA Inc."
"Assets continued to hemorrhage under the new owners. With wrap-fee plan providers — including Smith Barney Citigroup, Legg Mason (LM), Prudential Investments and LPL Financial — dropping 1838 from their manager lists and institutional clients bolting, the money manager had well under $2 billion when it pulled the plug, industry watchers said." "Ross K. Chapin, a managing director with Orca Bay Partners who became chairman of 1838 Investment Advisors following the management buyout, declined to comment on reports the money manager had closed." "Orca Bay's website still lists 1838 as one of the private equity firm's portfolio companies, but calls to the King of Prussia-based company's listed telephone number go unanswered, and its website no longer functions." Why ABIM's "Hedge Fund" (1838 Investment Advisors) Was Created in 1988 by Drexel Executives. DREXEL SWEATS THE SEC PROBE The securities cops are looking for major crimes. But even if they can't prove anything strictly illegal, they may bring charges in order to make new law. Mr. Brown was the Chairman, President and a director of 1838 Investment Advisors, LLC, an investment management company, from July 1988 until May 2004, President of MBIA Asset Management, LLC from 1998 until September 2004 and a director of MBIA Insurance Company from 1999 until September 2004. He is a director of the Rivus Bond Fund, The Harleysville Group, Inc. and The Harleysville Mutual Insurance Company, and was a Senior Vice President and a director of Drexel Burnham Lambert Incorporated for more than four years prior to 1988. Mr. Brown also serves as a member of the Board of Trustees of Eisenhower Fellowships, Inc., as a director of the Fox Chase Cancer Center and as a director of the Pennsylvania Horticultural Society. Mr. Brown has been an Airgas director since 1989. Mr. James Balog served as Chairman of 1838 Investment Advisors LLC. (investment management company). Mr. Balog served as a Director of First Great West Life & Annuity Insurance Co. since 1997. He has been a Director of GWL&A Financial Inc. since 1998. He has been Director of Putnam Reinsurance Company ('Putnam') since 1988. He serves as a Director of Partners L.P. (technical advisory board), and Trustee of Phoenix Partners and Euclid Mutual Funds (Mutual Funds). He served as Director of Great-West Life & Annuity Insurance Co. from 1993 to June 30, 2012. He served as Director of Transatlantic Holdings Inc. from 1988 to May 22, 2008. He served as Director of Transatlantic Reinsurance Company from 1990 to May 22, 2008. He holds a Bachelor of Science degree from Penn State University (Chemistry and Biology) and an MBA from Rutgers University School of Business (Finance). MOC Revenues Were Cleverly Designed to Increase Personal Finance and Political Power of ABMS and ABIM. MOC and deferred accounting tricks paid for goon cops, third party spies, legal intimidation, risk managers, merger specialist, PR firms, fallacious studies and corporate sponsors to promote them, extremely expensive lobbying, and lifestyles of the Rich and famous. Study Showing Sharp Revenue Increases benefitting the ABMS coffers, when there is more evidence and sentiment MOC harming the profession of medicine and patients. They won't go away--these greedy corporate fanatics and security forensic nuts with decades of experience in high positions. They manipulate the quality assurance organizations by infiltrating the boards. Right now they have legal power to use, copyright/civil/criminal prosecution, but we have to be aware of stresses that blow the lid off. The whole country is on edge with all the guns and violence. Do something Baron or appoint someone with a real moral compass and will to do something that we all know is right. To them physicians are political, financial pawns and nothing more. The rest is ABMS BS. Look at how Wachter had even me fooled. How disgusting to cover up fraud at the Hospitalist Company and even to bury the true fraud at the heart of the NQF Chuck Denham bribery/racketeering scandal. It is all the same people over and over and they need to be defunded and politically exposed as frauds. We are militarizing the ABMS and American society when we allow goon cops with violent felonies to be directors keeping files and spying on physicians. Is anyone else as outraged about this loss of fundamental democracy and constitutional guarantees as I am? Once upon a time physicians and citizens/patients had the right not to be bullied and scammed. Even the words patient bill of rights and patient protection is such utter fraud and lies. How long ago this process of MOC, Dr Wes findings, etc, has being going on.?? Many comments have being said about actions from DOJ; Attorney General; FBI... etc. Until today we have not seen any move from any of them.... Why??. Too much information , yet no actions!!! I think the issue will be resolved if we focus into each state Medical Association, they can present a change in the law to the legislator just like Oklahoma did. Cover-ups and lies told to physicians and the public. Are there two rules of law as one asked here correctly? One for the ABIM elites and their hired thugs; another for ordinary hardworking physicians? Is that how it was meant to be? Absolutely not. Yet, that is how it is. And the ABIM is protecting their abusive thugs who have harmed people. They are protecting those who have lied for a living. They are protecting them with legal funds paid for by physicians. Ariel Benjamin Mannes, the ABIM director of investigations was hired in 2008. Before being hired by the ABIM, Mannes violently beat the client of a nightclub where Mannes moonlighted as doorman. During the violent assault Mannes impersonated a police officer and aimed a loaded deadly firearm at those trying to help the assault victim from getting medical help. Mannes was indicted, and prosecuted for felonies after being arrested. He plead guilty in a plea to lessen the charges against him. Mannes was later found guilty in a court of law of two felonies: impersonation of a police officer and possession of an illegal firearm. He was fined $50 and did not serve any jail time. Why? Why was Mr. Mannes in possession of an illegal firearm? Why was he hired by the ABIM and ABMS? Does he possess a mind and temperament thinking he is above the law? Christine Cassel and Robert Wachter believe they are above the law and any moral reckoning. What prompted Mr. Mannes to beat a man punching and kicking him repeatedly so severely that he needed hospitalization? Why did Mr. Mannes impersonate a police officer in 2005 when he assaulted the nightclub victim? What prompts someone to impersonate and lie to control others like that. What prompts someone to manipulate others at the point of a gun. Has he done so before and after this event or while working for the ABIM or Caveon, etc.? Has Mannes at any time after the assault or assaults on others--while working at the ABIM--given the impression, appearance or suggestion that he was a police officer in good standing as his CV would falsely indicate? Did Mannes present the impression that he had an honorable discharge from being a police officer to the courts? Mannes imo was and is a compromised former law enforcement officer thrown off the DC police for harassment and intimidation and misusing his authority and resources to harm others. And he's a felon, yet the ABIM hired him to police, investigate and prosecute physicians. Why? Mannes was hidden from the physicians. His hiring was never announced. Why? Mannes as a highly paid officer with an almost unlimited freedom to investigate and pursue physicians. Why? Who was behind that hiring and what were their plans? Why is this director not listed on the 990 tax filings with the IRS? Why was a man who has lied on his online CV been put in a position to present investigate and present evidence against physicians? Is Mannes blackmailing, extorting, or in any way intimidating Dr. Baron or any of the ABIM or ABMS executives, officers or board members? Why is Mannes given legal protection from the ABIM and Ballard Spahr? Why is the DOJ and the State Attorney General not protecting us? Why? I want answers to all my questions and why MOC is imposed on physicians! Is the DOJ and the Attorney General failing to prosecute the real criminals which results in increased violence and crime in America? Loretta Lynch in 4.5 hours of Judiciary Committee testimony has changed America dramatically today. By not answering one question from Judiciary Committee members about Secretary Clinton's email scandal Attorney General Lynch has turned a great many Democrats into Republicans or Others. Anyone who watches this congressional "testimony" on Hillary Clinton's national security breeches and transgressions involving her Libyan and Syrian adventurism will quickly understand why Republican turnout in the 2016 election will be high and many democrats will switch parties. I never thought that a US Attorney General could do so much stonewalling and whitewash of justice and truth in a brief few hours. I have never been more ashamed of the American Democratic party and their unwillingness to restore some balance to the government and help reduce the corruption that has overtaken politics and the conflicted corporate special interests agenda they serve. In half a work day Lynch makes Christine Cassel's conflicts of interest all make more sense. It tells us why Bob Wachter and Dr. Cassel have had so much influence over the justice department and departments of health. They are elites who cheat, and they have immunity from investigation, indictment and prosecution because of their protected party affiliation and crony corporate agendas. It is disheartening seeing Lynch cheat the American people out of getting facts and refusing to actually inform herself of the Clinton case beyond just accepting the recommendation of her team. The Attorney General's unwillingness to exercise her judgment and make her own decision has darkened the light of the American democratic process. It cannot work without an informed populace. After watching Lynch and her highly rehearsed cover story, many of us watching have become frightened of Hillary Clinton's integrity, honesty and appetite for power. The "I'm with her" fanfare will quickly fade and people will wake up to the horror that the Clinton's represent. There will be manipulation of foreign and domestic affairs if Hillary is elected president like nothing we have seen before. Life in America will be an Orwellian nightmare where physicians will be prisoners of Hillary-speak policies and the rigors her odious corporate-style healthcare regime will impose. The common denominator for Cassel, Clinton, Wachter, and Baron is that they all cheat and profit from their deceit. The ABIM Foundation has a complex history, but I think Wes is right that part of that motive--a big part of it--is political and social. The seeds of Choosing Wisely started imo with a George Soros funded group called "Death in America". It was somewhat secretive like the ABIM Foundation. Christine Cassel was present at Soros' private house in the South Hamptons for a weekend retreat when the philanthropist granted the first $15 million dollars to a group of geriatric physicians/palliative healthcare leaders studying how folks die. Anyone can research this online by cueing the non-profit group associated with "Death in America". I know it sounds rather sinister, even sick, but ideas and movements have their origins and seeds somewhere. It usually starts with a catalyst of a few individuals and money. What Soros wanted out of it? I think that there is something to be learned from looking at this part of the ABIM story. Cassel maintained a looser connection with the group later on. Many say there is cause for alarm in how George Soros manipulates societies and markets to create social unrest/ instability/ change and makes a billion at a pop doing it. The recent Black Friday is an example, predicting it, then profiting by the panic one creates in exasperating it. Chaos creates profit. Movement of the markets create profit. Big movements in markets creates wealth and power. Cue your computer to George Soros and one can draw one's own conclusions. He predicted race wars in America and even funded/fueled the flames in Ferguson through Black lives matter. His funding of people to disrupt Republican rallies has been noted online. Based in comment # 16(previous). Perhaps our only choice is to contact every State Medical Association , in order for them to initiate conversations with legislator to try to pass a law like Oklahoma. In my opinion this is the most viable option we have( See comment # 14). DOJ; FBI; Attorney General are to occupied with the Clinton.
" Christine Cassel's conflicts of interest all make more sense. It tells us why Bob Wachter and Dr. Cassel have had so much influence over the justice department and departments of health. They are elites who cheat, and they have immunity from investigation, indictment and prosecution because of their protected party affiliation and crony corporate agendas.". Taken from previous comment). Good pragmatic approach. The state legislation until all are covered and the public is protected. Choosing Wisely, ABIMF and the State Department under Hillary Clinton and John Kerry. The "globalist" corporate healthcare agenda. No one has time to follow all the bureaus of our federal government. But everyone should familiarize themselves with the State Department. One can do so through the press conferences both live video taped Q and A and the transcripts. You can go to the archive for verification of our current and past policies. Link below. Matt Lee who has followed the State Department for years and flies around with the Secretary of States is often a thorn for them but he is a good honest reporter and digs for the answer or tries to coax it out. Matt Lee is to the State Department what Wes Fisher is to the ABMS, ABIM, etc. We have no MSM reporters following the ABMS but we should. Whether we like it or not they are connected to the government and corporate America in a big way. They should offer transparency and regular press conferences with Q and A. The ABMS has little to do with public safety and much ado about control/fleecing of physicians pocketbooks. The fact is clearly established. The funding for this control/regulation of physicians come through regulation of time and money. The money to do so comes from physicians themselves. Only a well informed citizen can understand the complexity of healthcare today and what is happening with cost controls/rationing or healthcare resources. For example, the State Department spent 5 billion dollars on funding a change of government in the Ukraine according to our undersecretary of state Victoria Nuland, a Hillary Clinton appointee working at Foggy Bottom. She should know because she led the charge. With a 20 trillion dollar debt, largely due foreign military actions and per-occupation with nation building and military interventions we have created a horrible situation for the healthcare system, which is vying with our defense budget for the number one position. Choosing Wisely is a government/corporate protected program to ease the burden of healthcare costs. I will not speak about the unintended consequences of such unscientific social experimentation, but CW appears to be a large research project that went live in 2012. Wes has got his facts straight on this one IMO. The fact that the ABIM/ABMS/ABIMF/RWJF, etc, has had advisors to the current POTUS or ex-president for the past two decades should not surprise us. The necessity of controlling/regulating physicians has the undertones of the corporate takeover of government and the use of our military to expand and support corporate and political interests abroad. There is little that is humane in these actions, except for window dressing disseminated carefully/periodically. Anyone who cares to do the research on this will quickly discern that the ABIM and ABMS should be of immense concern for physicians and the public. They are of great concern for our political/corporate elites. The corruption is astounding and whether one accepts reality or not, the combination of corrupt corporations influencing, if not controlling our government, is a lethal combination. It is a volatile cocktail that is blowing up in our faces, because it has all gotten away from us. Physicians and the moral integrity that they may represent is a key part of the fight to preserve a dignified and free way of life that does hopefully no harm to others. Choosing Wisely should be investigated by a special council that is impartial and has authority to make it go away. It is not in the best interest of the public or our nation. It has only enabled ignoble political and social experimentation to overtake reason, science and common sense. The deaths should have been investigated and a moratorium put in place until a thorough study was made of the consequences to the public health and physician patient relationship. CW is a danger to healthcare and its cost controls have its origin in foreign expenditures of enormous cost to lives, the public and the stability of the world. about every other first world country would solve a lot the the problems articulated here and eliminate the need for a lot of the NGOs that are of concern . Medical care funded by tax dollars would solve a lot of the problems and concerns expressed on this blog.With Medicare the administrative system is allreadty in place . A single payer national health insurance system in the US would look like what? The VA? I know the VA from the inside and it has gotten even worse over the past several years. Unfortunately, a single payer system in the US would obviate the need for many more regulatory bodies to control costs and regulate physicians. Regulatory bodies and blue panel commissions, and so on will bring about an even further degradation of the practice of medicine and everyone involved. Look at what has happened so far in our transitional period. We will have more onerous and restrictive requirements than even the current ones. Hillary Care under Ms. Clinton--if elected president of the United States--would mean that an unaccountable system of governance would be even less accountable. The only assurance that physicians would have under a Hillary Care Regime is that docs, PAs, NPs, nurses and everyone else would be lied to without prejudice. By the way I supported Senator Clinton in 2008, but I woke the hell up following her antics as Secretary of State and her email lies. I take perjury to be an even more serious indictable offense breaking the public's trust. That is what the ABIM has done and the mainstream news is of course keeping quiet about it. The ABIM scandal is all about Cassel, Clinton, Langdon and Baron's own trademarked brand of lies and obfuscation. It too is about dirty tricks, cheating and the corruption within the democratic party. How much money did they spend and lose each month on this catastrophic scandal? Including the ancillary services like caterers, entertainers, and other providers? Who was guarding the doors and minding the security cameras in the garage, hallway and outside the building?